Challhuaquen, which in the local Mapuche word means "fishing place", is located in front of the National Park Los Alerces, at the heart of the Argentinean Patagonia. Good fishing in crystalline waters, surrounded by glaciar lakes, millenarian trees, and magnificent landscapes are combined in Challhuaquen Lodge, with its elegance and comfort that will make such experience unique. Challhuaquen, which in the local Mapuche language means "fishing place", is located in the Trevelin valley, Province of Chubut, on the bank of the Futaleufu river or Rio Grande, in front of the National Park Los Alerces, heart of the Argentinean Patagonia. Created by and for fishermen, Challhuaquen's ultimate goal is to get the maximum pleasure out of an exceptional location for the practice of fly fishing. Based on that priority, qualified and personalized service provide all it is needed for a successful fishing season amid a luxury set up. Thus, understanding the need for relaxation and privacy, the lodge has only six spacious and comfortable double guestrooms, each with private bath; all facing the Futaleufu river with the constant backdrop of the National Park and the Andeans on the horizon. Similarly, acknowledging the fraternity aspect of fishing, Challhuaquen counts with ample and fully equipped common areas and a bar to rest and enjoy tying-fly with the company of a good friend and/or a fine drink. Furthermore, thinking about the eventual desire to enjoy the maximum of luxury, the lodge offers a SPA, with sauna, hydro massage, scotch shower, and personal massages that also benefits from the magnificent river/mountain/park view. Needless to say, and always aimed at satisfying the fishermen needs, all rooms have direct access to the Futaleufu river and to a dryer-room. To complete the perfect flying fishing day, the chef at Challhuaquen Lodge has the skill to please international preferences or adventure those more curious to the culture of typical Patagonian dishes. Each meal is served in our homely restaurant with impeccable presentation, and accompanied by finest Argentinean wines. The fishing area called Comarca de los Alerces, is internationally known as one of the most important Salmonidal fishing places in the world. It is characterized for its big number of original glaciar lakes and hundreds of rivers and streams, with a variety of trouts as well as salmons, wich were introduced in this territory 100 years ago. Challhuaquen is placed at the north shore of de Futaleufu river, considered itself one of the greatest fishing spots in the Patagonia. 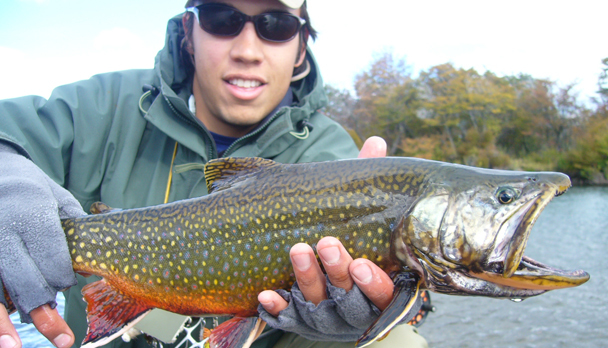 The trout of Patagonia (brown, rainbow, and brook trout) averages 12-20 inches. 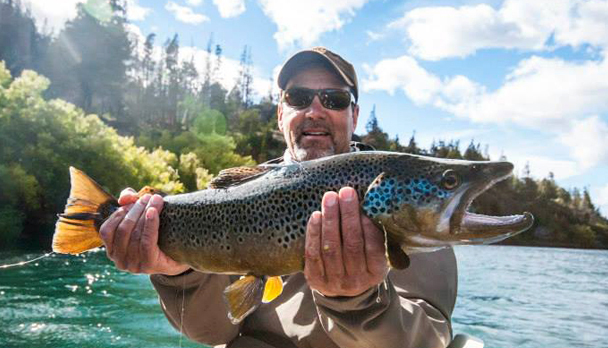 Intermediate fly fishermen can expect to land trouts of over 20 inches and experienced anglers have a good chance of landing 5-15 pound trouts. 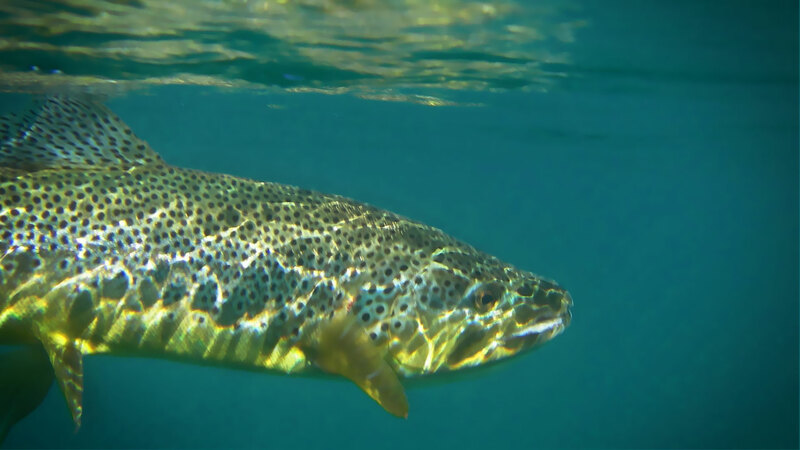 Many rivers also contain landlocked salmon, which can exceed 10 pounds. Challhuaquen and Patagonia offers a first class "off-season" fishing (November thru mid April), in a scenery very similar to the western states in the US, particularly Montana and Wyoming some 50 or more years ago. Good fishing in crystalline waters, surrounded by glaciar lakes, millenarian trees, and magnificent landscapes are combined in Challhuaquen Lodge, with its elegance and comfort that will make such experience unique. A distinguished lodge built on a gully located as a viewpoint towards the river, and surrounded by the majestic mountain ranges of the Andes, ancient natural forests and the Futaeufu River of happy colors. - 6 double rooms with private bathroom and a view of Futaleufu River and the National Park Alerces. - Restaurant with international and Patagonian cuisine accompany a huge selection of Argentine wines. - Viewpoint and reading room. - Spa with dry sauna, jacuzzi, scottish shower and massage room. All of our fishing is in rivers and streams, wading from the coast and sometimes on floating trips and float-tubing. One pair of fly weight chest waders and one pair of neoprene chest waders is recommended. The new waders "non-condensation" is the best for walking. The comfort of your wading shoes is very important also. #4 Wt or #5 Wt for dry flies and nymphs. #6 Wt or #7 Wt for Boca or streamer fishing. #3 Wt for spring creeks and small flies. --Floating lines for each rod. --Shooting head sink tip line 7-8 weight (like Teeny T200 or T300 or shooting line sink V). Baking 75 - 100 yards is sufficient. From 4 to 12 feet long. Tippet material is extremely important in Argentina. The trout are very strong and powerful. Your tippet material should be sheer resistant as well as have the maximum breaking strength in small daymeters. Bring plenty of flies. You can lose 6-10 flies a day on snags, in trees, by breaking off fish or on stones. Sizes 4 and 6, some bigger flies (size 2) and some smaller size 8 flies. The color is black, brown and olive. Sizes 10 - 12 and 14, weighted and unweighted. --Montana nymph - Prince - Hare�s Ear - Pheasant Tail - Zug Bug. 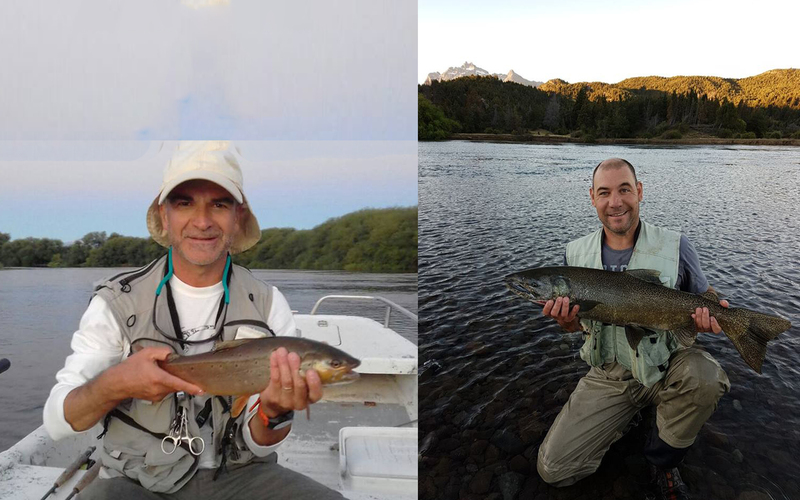 Rates include: Transportation to/from airport (Esquel/Bariloche), lodging, daily bilingual guides fishing, transportation to/from fishing areas, fishing lincese, Lodging with all meals with fine Argentinean wines, beer and soft drinks, cigars. Rates do not include: Air transportation, airport taxes, personal life insurance, laundry, personal phone bills, tips, personal gear, rods, reels flies, hard liquors and gratuities. Notes: Ask for special discounts. For groups of 6 or more anglers 1 is free ! Just a short note to thank you again for making the arrangements for my travels within Argentina and my stay at Challhuaquen Lodge. I returned to Los Angeles from Buenos Aires late yesterday morning, with a short layover in Miami to go through Immigration and Customs and change planes. And, Marta, a special thanks to you for the cars and drivers in Buenos Aires - everything worked perfectly. Our trip was fantastic !! Thanks for the perfect organization. Both lodges were great!! At Los Laureles dove-shooting was outstanding, ducks was ok maybe it was to early of the season, the dorado fishing was very poor because the water was much too brown for fly fishing. But service and the guides were very welcoming and very nice. Food and wine was excellent.? Challhuaquen Lodge is one of the nicest lodges I have ever seen. Everything was excellent. We enjoyed the fishing at different destinations. But a dreamfish (browntrout or maybe landlooked Atl. Salmon???) I caught in front of the lodge. Look at the picture! So Connie, Johannes and I had a beautiful time in Argentina. As usual, Challhuaquen Lodge and the entire experience were wonderful. All the people at the Lodge were extremely nice and now treat me as "part of the family". 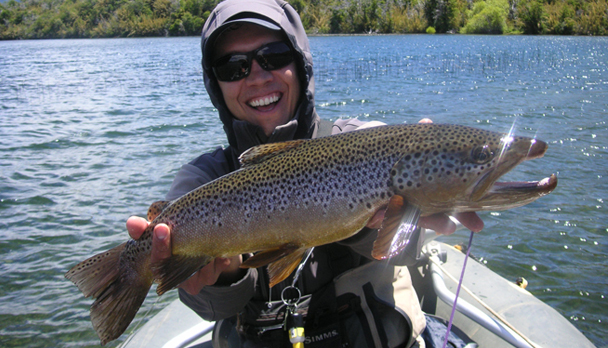 I spent four days fishing the Futaleufu (catching many, many rainbows and a few browns), one day fishing Laguna Larga (exclusively brown trout and lots of them) and one day fishing Rio Rivadavia (I caught about 20 trout, including one brook trout and one very large brown trout [and hooked and lost another 15-20 trout] - for a "grand slam", as my guide Pablo Manavella phrased it - best I've ever done on that wonderful stream). It's a long distance for me to travel from Los Angeles, but it's well worth it. Thanks very for all your help. I hope all is well with you. Challhuaquen. The fishing was fantastic !!! My week at Challhuaquen was fabulous. 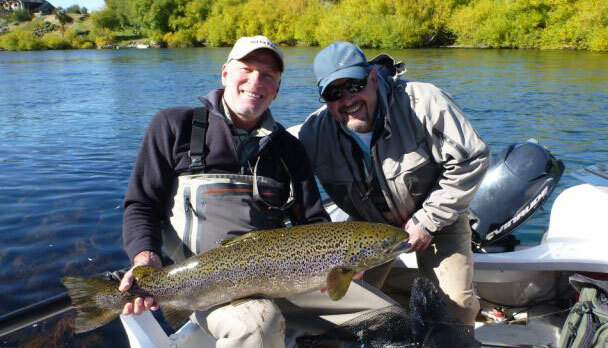 The fishing was fantastic (the rainbows in the Futaleufu were feasting on mayflies most of that week and I caught dozens and dozens of them using a No. 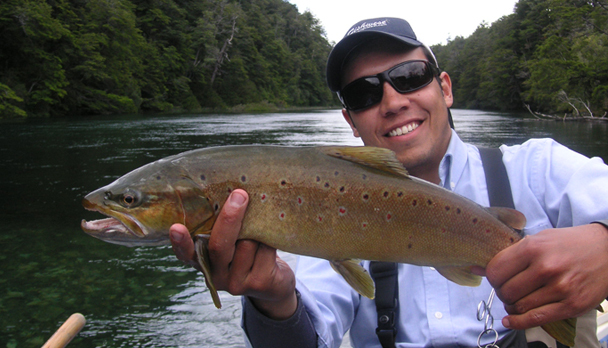 14 Adams dry fly, and I also caught several large brown trout) and Gustavo and his staff treated me like a king. Guillermo Sagui was my guide all week and he was terrific. We have become good friends. Happy New Year to you as well. All the best.